The old argument whether Bach’s music is better served by this instrument or that is mute when the performances of it are superb. I would much rather hear a great performance of the solo violin sonatas on marimba than the violin, if the former serves the music better than the latter. That said, I’ve always—and still do—prefer my solo Bach keyboard works performed on the piano. I’ve always thought that there is nothing quite as grating on the ear as the sound of a terrible harpsichord. But following my own advice, and after hearing Hantaï’s performances here, I am willing to concede that when played well and tastefully, Bach’s music speaks equally well here as on my favored instrument. What I particularly relish in this recital is Hantaï’s very human approach to this music: While there are moments of reverence throughout, perhaps most especially in the numerous chorales that dot this recital, there are moreover moments of humor, of joviality, and of sheer fun. There is hardly a performance of the Italian Concerto that so bustles with joy and life as does this one. Throughout Hantaï uses tasteful ornamentation to keep one’s interest in the first movement’s numerous ritornellos and has a good sense of stop-and-go motion—he simply delights in the drama inherent in this movement. The slow movement, though a bit metronomic in effect, is beautifully shaped and has a lovely sense of forward momentum, while the last movement bursts forth with energy. The two English Suites are both rendered majestic through the harpsichordist’s elastic tempos, his tasteful if sometimes flamboyant ornamentation, and the numerous shifts in color, perhaps no movement being more successful than the moving A-Minor Sarabande to the Second English Suite. The numerous shorter works make for fine additions to this recital for many reasons: The chorales provide a wonderful sense of calm before the more stormy movements, while the A-Minor Fantasie acts as an improvisatory prelude to the more fugal opening Prelude of the A-Minor Second Suite, at once expanding and yet enhancing the effect of the movements which follow. 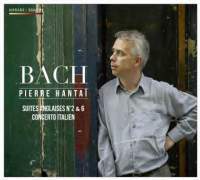 If one loves the harpsichord, then one would be hard pressed to find a finer living advocate than Hantaï; but if one is not a fan of the instrument, then perhaps this recording will make one like it ever so much more. It certainly did so for me. And I could think of no better reason to run out and grab a recording as to relive that feeling over and over again. Though it’s been a good month of listening for me, there’s no end in sight!